Page best viewed at 800 by 600 resolution. The small ones are 8" ( 203.2 mm ) stretched. The one large one is about 13" ( 330.2 mm ). 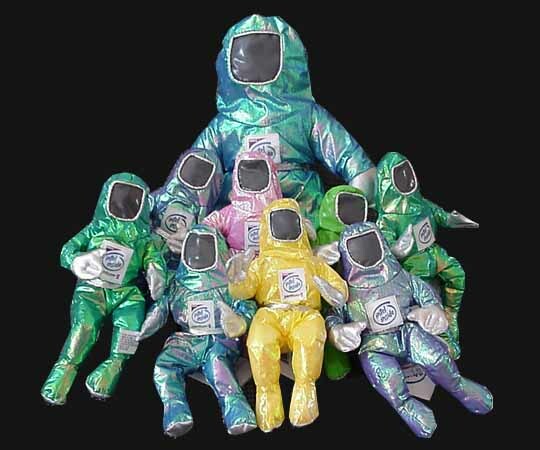 These dolls were part of the Intel ™ advertising campaign for the new, at the time, Intel II chip with MMX technology, which had to do with multimedia. I remember the colorful commercials on television with the dancing robotic figures in bunny suits (read below), assembling the Intel chips. It's hard to believe that much time has passed by. The computer that made this webpage is an Intel Pentium 4, 2.53 Ghz machine. 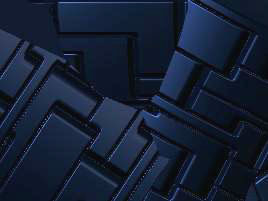 The technology is becoming overwhelming to me, and I feel the best is yet to come! Why are these robots, and not just men in bunny suits? These are dolls of people in "Bunny Suits", so actually these could be considered people and not robots. 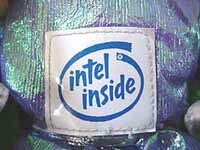 However, the labels on the dolls say, "Intel Inside", indicating these are robots. The commercials looked very robotic as well. "The Bunny People tm characters are modeled after the highly trained technicians that manufacture Intel micro-processors in ultra-clean manufacturing environments. Wearing a "bunny suit", protective clothing which prevents even the smallest dust particles from contaminating the microprocessors being manufactured, these technicians manufacture highly complex chips like Intel's newest Pentium® II processor. The Pentium II processor core has 7.5 million transistors connected by electrical paths called circuits, which are thinner than a strand of human hair. 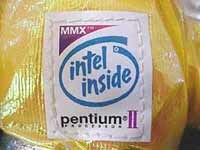 The Pentium II processor is capable of processing millions of pieces of information and is the highest performing Intel microprocessor available today." The History of the Integrated Circuit- Fascinating stuff!